Lent (Pascha) is the principal religious holiday for Greek Orthodox Christians. ​In many ways Great Lent is similar to Lent in Western Christianity, yet there are some differences between the Greek-Orthodox and the Western timing of Lent (besides calculating the date of Easter) and how it is practiced, both liturgically in the public worship of the church and individually. Most years, the Eastern Pascha falls after the Western Easter, and it may be as much as five weeks later. Occasionally, the two dates coincide. Like Western Lent, Great Lent itself lasts for forty days, but in contrast to the West, Sundays are included in the count. In 2019, Orthodox Easter falls on Sunday, April 28. The first ceremony takes place on Good Friday where the "Epitaphios", an imitation of the Christ's funeral bier, is decorated with many flowers by the local women. The "Epitaphios" is then paraded in a procession through the streets and the neighborhoods of each parish. 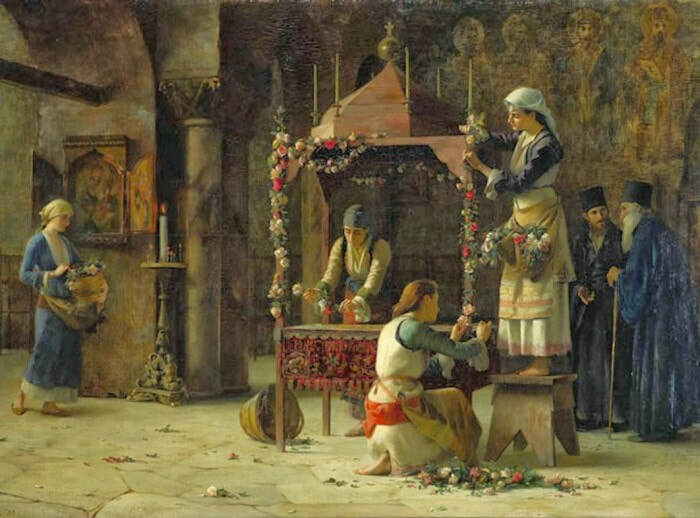 "The Decoration of Epitaphios", 1893, by Theodoros Rallis (1852-1909). ​A great celebration also takes places on the Saturday, for Christ's triumphant return. At the stroke of midnight, all the lights of the churches are put out to symbolize the darkness which enveloped Christ as He passed through the underworld. Then a priest appears holding aloft a lighted taper, lit by the Holy flame which has been air-transported from Jerusalem earlier in the day, and chanting "Afto to Fos… "(This is the Light…) and uses the Holy flame to light the candles of nearby worshipers. These worshipers then share their Light with their neighbors, until the entire church and the courtyard is illuminated by the candlelight. 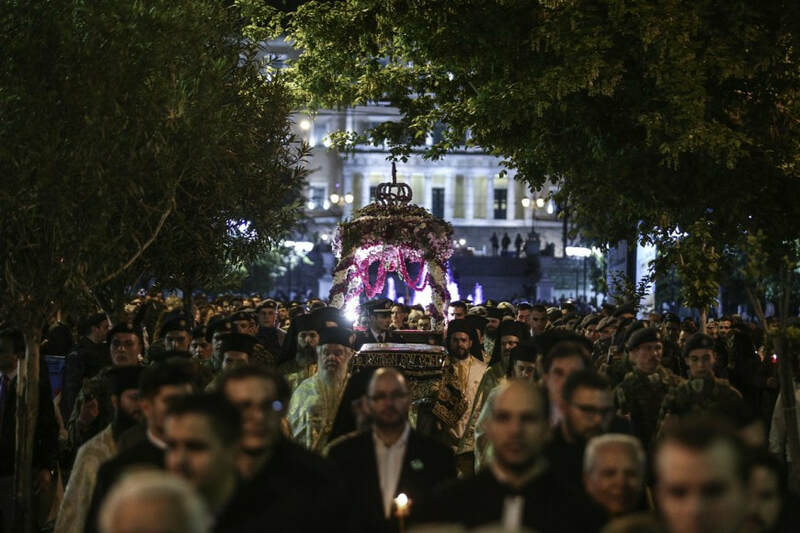 The procession of Epitaphios in Syntagma Square.